The body of Bhismadeva lost its material effects due to being surcharged with spiritual realization, and thus the body was spiritualized as when iron becomes red-hot when in contact with fire. The body of a fully self-realized soul is not, therefore, accepted as material. Special ceremonies are observed for such spiritual bodies. The respect and recognition of Bhismadeva are never to be imitated by artificial means, as it has become a fashion to observe the so-called jayanti ceremony for any and every common man. 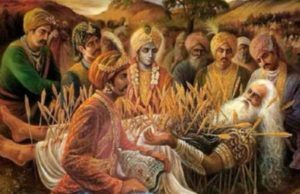 According to authorized sastras, such a jayanti ceremony for an ordinary man, however exalted he may be materially, is an offense to the Lord because jayanti is reserved for the day when the Lord appears on the earth. Bhismadeva was unique in his activities, and his passing away to the kingdom of God is also unique.